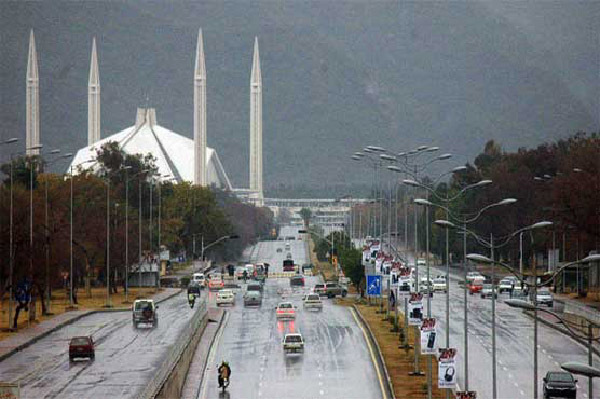 ISLAMABAD, Aug 29 (APP): Rain-thundershowers associated with gusty winds is expected at a isolated places of upper region of the country while dry weather to prevail elsewhere in the country during the next 24 hours. Rainfall is forecast in upper Punjab, upper Khaber Pakhtunkhwa, Mirpurkhas division, FATA, Gilgit-Baltistan and Kashmir during this time span, an official of met office told APP. Weak Seasonal Low lies over North Balochistan. A Low Pressure area lies over Northwest Rajasthan and adjoining areas. A fresh westerly wave is also likely to enter upper parts of the country on Tuesday (evening/night) Moist current is penetrating eastern parts of the country. In last 24 hours rain-thunderstorm occurred at scattered places in Punjab, Sindh, Islamabad and Kashmir while at isolated places of Malakand, Hazara, Bannu, D.I. Khan, Khuzdar, Sibbi divisions, FATA and GB. Rainfall recorded during this time duration was Punjab: Sahiwal 35mm, Okara 24mm, Mangla 14mm, Bawalnagr 12mm, Murree 02mm, Rawalpindi 01mm. Sindh: Dadu 61mm, Karachi (Landhi 54mm, Airport, Shahra-e-Faisal 31mm, Gulistane Johar 30mm, Gulshan Hadid 25mm, North Karachi 18mm, Masroor Base 10mm), Mirpur Khas 26mm, Mithi 04mm, Chachro, Badin 03mm. FATA:Parachinar 11mm, KP:Kakul 14mm, Balakot 03mm, Kalam 01mm. Kashmir: Muzaffarabad 20mm, Rawalakot 14mm, Garhi Dupatta 07mm, Kotli 06mm. Gilgit-Baltistan: Skardu 08mm, Astore 04mm and Gupis 01mm. Maximum temperatures recorded on Monday remained Turbat 45øC, Dalbandin, Nokkundi 41øC, Peshawar 37øC, Quetta, Faisalabad 35øC, Chitral 34øC, Multan, Lahore 33øC, Dir 32øC, Kalat, Hyderabad, Islamabad, Karachi 30øC, Gilgit 27øC, Hunza 25øC, Muzaffarabad 22øC, Murree 19øC and Skardu 18øC.